Where Did We Go Wrong with Leadership Development? Most of us seem to intuitively understand the connection between leadership and success, because collectively we invest a lot of time and money in self-help classes and books intended to improve our leadership skills. In 2011, the self-help market in the U.S. was worth a whopping $10 billion. Although a significant portion of this money goes to health, fitness, and weight-loss programs, these are closely followed by financial, business, and personal development products. Likewise, businesses also invest heavily in leadership development. In 2012, American corporations spent $13.6 billion on leadership-development programs, an increase of 14% over the year before. On average, companies were willing to spend thousands of dollars on training and resources for individual frontline and mid-level managers, more than $6,000 on senior executives, and upwards of $7,000 on high-potential employees. In fact, annual spending on leadership development has been steadily increasing since 1996. But there’s a problem: all this investment isn’t making us better leaders. On the contrary, there is a negative correlation between the macroeconomic amount spent on leadership development and our collective confidence in leadership. In 2015, Brandon Hall Group surveyed more than 500 organizations across 34 countries and 31 industries, and what they found was alarming: Half of the respondents reported that their current leaders didn’t have the requisite skills to effectively lead their organizations at this time. Moreover, 71% of the organizations said their leaders were not prepared to lead the company in the future. Clearly there is a global leadership problem, despite people’s desire to be better leaders, and despite the ever-increasing amount of money being spent on leadership development. Where are we going wrong? As we’ve already seen, the problem isn’t a lack of knowledge about the nature of leadership; conceptually, the skills and behaviors of great leaders are well understood. It turns out the problem is with the way most people approach leadership development. If you want to learn a new skill or get better at something, the advice you’re most likely to get from friends, family, colleagues, and mentors is “read a book or take a class.” This is especially true in most corporations, where human resources will point you to a corporate university catalogue filled with online or in-person courses. In fact, training is the go-to solution for most personnel development in the business world. A 2017 LinkedIn survey found that 78% of companies use mainly instructor-led classes to teach what they consider the most important professional skills — leadership and people management. We regard books and classes as the ultimate way to learn because they often seem to be the easiest solutions, and because they’re the most familiar. We spent most of our childhood and young adulthood learning in classrooms and reading from textbooks, so it’s only natural that we continue to rely on them. But that’s actually the problem: It turns out that books and classes aren’t the best way to learn new skills. In fact, research in business settings shows that classroom-based training is usually not effective; people end up using only 10% of what they learn in the classroom on the job. There are a number of reasons why traditional classroom and book-learning approaches to leadership development aren’t effective. One is simply that we forget most of what we read about or are taught in the classroom. In the early days of psychology, Hermann Ebbinghaus, a German scientist, tested the capacity of human memory by experimenting on himself. He set about learning nonsense words that followed a simple pattern of consonant-vowel-consonant, such as “REH,” but had no meaning. Since the words were meaningless, he could not associate them with anything already stored in his memory. He dedicated time to studying his nonsense words over and over again, then tested his ability to remember them. In this way, he hoped to measure memory in its purest form. Ebbinghaus found that one hour after studying the nonsense words, he had already forgotten 35% of them. After one day, he could remember only half of the words. And six days later, he had forgotten a staggering 85% of the nonsense words. This finding became known as Ebbinghaus’s forgetting curve. A similar pattern of forgetting has been also found among people who studied a foreign language such as Spanish, so it’s not just nonsense words that we forget so rapidly. The second reason why traditional leadership development is ineffective is that, during training, people acquire mainly knowledge, not skills. Knowledge can be useful, if you can retain it and recall it at the right moments, but skills are what make us better at actually doing things, and skills are only developed through a systematic exercise regime known as deliberate practice, which is very different from acquiring conceptual knowledge. Perhaps the best way to understand the difference between knowledge and skill is to look at music education. If you’ve ever learned how to play a musical instrument, such as piano, you know that simply taking a music theory class or watching a YouTube video of someone else playing the piano won’t make you a concert pianist. To learn the many skills that are necessary to play the piano, you have to sit down at the keyboard yourself and practice those skills — a lot. Learning to be a leader works the same way. Like playing the piano, leadership is more about skills than knowledge. The only way to become a better leader is to improve your leadership skills through deliberate, sustained practice — something traditional leadership training rarely provides. The last and perhaps most important reason why traditional leadership training doesn’t work is that it fails to take into account the overwhelming influence that habits have on human behavior. Most leadership training rests on the assumption that our daily behavior is rational, deliberate, and consciously controlled — but this assumption couldn’t be further from the truth. We are creatures of habit, personally and professionally, and no amount of classroom instruction or book learning alone can build the habits that will make us better leaders. So, what is the alternative? The answer lies in developing better habits. When leaders act badly, it’s usually out of a bad habit — something about the situation makes them unconsciously slip into a bad behavior without realizing it. The good news is, by turning leadership skills into habits, we can train ourselves to automatically respond to situations with effective behaviors, thus becoming more effective leaders. The method is simple: You identify a leadership skill you want to master, such as active listening, then you practice that skill through a short, focused exercise every day until it becomes a habit. I call this the Leader Habit Formula. The Formula is different from other leadership development programs. Instead of relying on theoretical knowledge and classroom-based learning, the Formula is a continuous process that helps you develop leadership skills through deliberate practice. This approach is based on scientific observations about how people most effectively learn new skills, and how powerfully habits affect our behavior. The better your leadership habits, the better you will perform as a leader — and the more successful you will be. Every aspect of your personal and professional life has the potential to be influenced by automatic, habitual patterns of behavior. From the moment you wake up until the moment you fall asleep, you carry out the same, consistent routines. And many of your routines are completely automated – you don’t even know you do them, or you might call them something esoteric like intuition or sixth sense. Any leadership skill starts as a weakness; you haven’t practiced the skill and so you have to pay very close attention to it, because you don’t yet know how to do it well. This stage takes a lot of effort and concentration, and you will make many mistakes along the way. Consider, for example, learning how to inspire your followers with a vision. There are multiple parts to this skill – being able to picture the arrival point, so that you can concretely define it for your followers (think “man on the moon”); having the foresight to understand where the group or company is heading; and understanding your followers’ values and needs, so that your vision will appeal to them. As you continue to practice the skill, your brain will start to automate some of the basic processes, like remembering the sequence of tasks and perhaps becoming better at a particular portion of the sequence. Maybe you will find a way to read your followers that enables you to quickly understand their values and needs without much concentration, or maybe you are a visual person who can easily imagine the arrival point. As your brain internalizes the processes that make up the different parts of the skill, the skill will begin to seem easier. You are now becoming proficient. The more you continue to practice, especially the things you find more challenging, the closer you are getting to mastery. When you achieve mastery, you are now good at the skill, you can do it confidently, and others recognize your mastery. But even though you have mastered the skill, performing it still requires concentration and effort, because automaticity has not fully formed — the skill is not yet a habit. 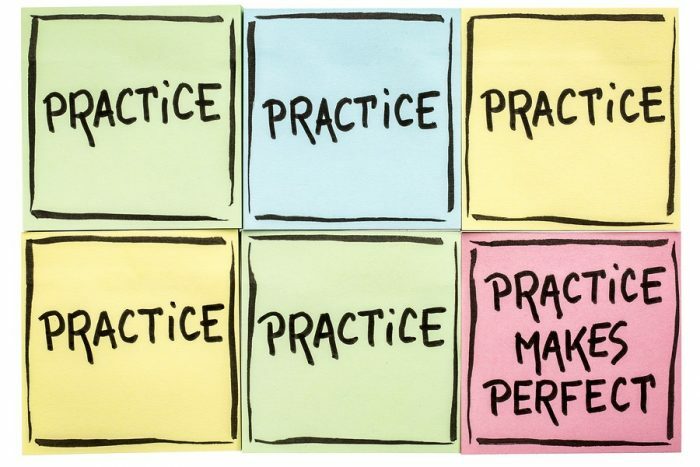 It takes practice beyond mastery, what psychologists refer to as over-learning, to fully form a habit. If you persist to the point of habit with the skill of inspiring followers with a vision, you will find that what once felt difficult and unnatural and required a lot of effort and concentration now happens effortlessly. Adapted from The Leader Habit: Master the Skills You Need to Lead in Just Minutes a Day by Martin Lanik. Copyright (c) 2018. All rights reserved. This book is available at all bookstores and online booksellers.